Headers: Headers are variously used in different fields of Computers. These are control information that is attached to data which guides it and makes it error free, reach destination reliably and make the data travel faster etc. In Computer Networking IP datagrams also known as Packets. These IP datagrams composed of two parts the Header and payload (data), it is just like html page the header and the body respectively. Every protocol follows a different header format for its data to be transmit and received reliably. Like IPv4 header each layer of this header is 32 bits or 4 octets. However this is fixed vertical length header i.e. 40 octets and by using extension headers more control information and data is added later. Version: This is 4 bit in length and tells the version i.e. 6 for IPv6. DS+ECN: Like IPv4 this is 8 bits in length and tells the information for Differentiated Services and Congestion control. 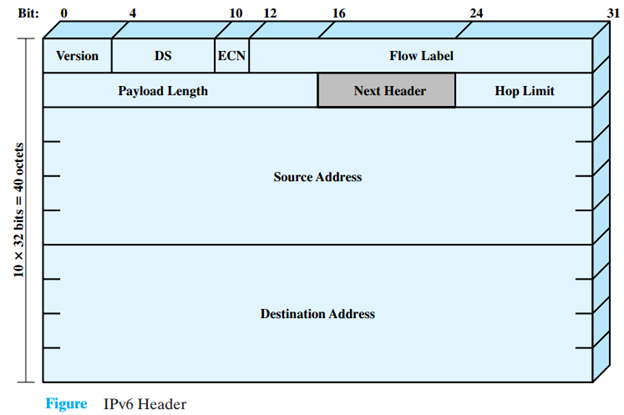 Flow Label: This is 20 bits long and used by hosts to tell router that specific packets need special handling. Payload length: This tells the total length of all the extension headers its 16 bits in length. Next Header: It is 8 bits in size and identifies the type of header immediately following the IPv6 fixed header. Hop Limit: Same functionality as TTL in IPv4 this 8 bits word tells the remaining allowable hops for this packet. Source Address: This is 128 bit long and divided into 4×32 i.e. 4 Layers. This tells the address of the originator. Destination Address: The address of the intended recipient of the packet and this is also 128 bits long and divided into 4×32 bits. This concludes the Fixed IPv6 header which has total length of 32+32+128+128 = 320 bits or equivalent 40 octets.